Former Massachusetts House Speaker Salvatore F. DiMasi and two associates faced federal public corruption charges, accused of using the power of the speakers office to steer multimillion-dollar contracts to a software company in exchange for hundreds of thousands of dollars in kickbacks. DiMasi was found guilty. 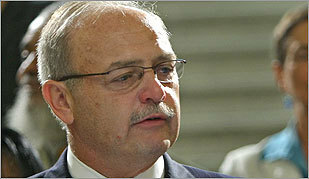 A financial adviser and former DiMasi associate who faced federal corruption charges along with the ex-speaker. A Beacon Hill lobbyist and longtime DiMasi friend who also faced corruption charges. The ex-Cognos vice president pleaded guilty and cooperated with investigators in exchange for a reduced sentence.